Independent journalist Elchin Ismayilli, who used to contribute to Cumhuriyet newspaper and Azerbaijani Saadi, was detained on 17 February on charges of extortion through intimidation and abuse of power, reported Azadliq Radio. According to the journalist’s lawyer, Ismayilli is being charged for threatening an employee of the local culture and tourism department. The journalist says the allegations are not true. A month before, Ismayilli asked to borrow 1000AZN from the person who is allegedly accusing him of extortion. He was detained when picking up the money. During a meeting with his lawyer, he explained he had known this individual since 2003 and that they had good relations. In September he received a warning from the police on was called into questioning for allegedly assaulting an officer. The journalist ties both incidents to his work. The French police prevented freelance journalist Alexis Kraland from accessing a demonstration in Place de la République, in Paris, on 18 February, the journalist reported on Twitter and confirmed to Mapping Media Freedom. Kraland was intending to cover a protest in solidarity with a young man called Theo, who was allegedly raped during a violent police arrest. The police asked the journalist for his press card which is not necessary to cover a demonstration as a journalist, Kraland told Mapping Media Freedom. The Federal Migration Service won its case against Demyan Kudryavtsev, owner of Independent Media, on 21 February, Vedomosti reported. “It has been established that false data was deliberately submitted in this citizenship application. The Supreme Court acknowledged this”, the court’s press service stated. FMS did not receive all the necessary data in the application submitted in 2009, Kudryavtsev told Novaya Gazeta. The President or FMS is now able to deprive him of his citizenship based on the court decision. 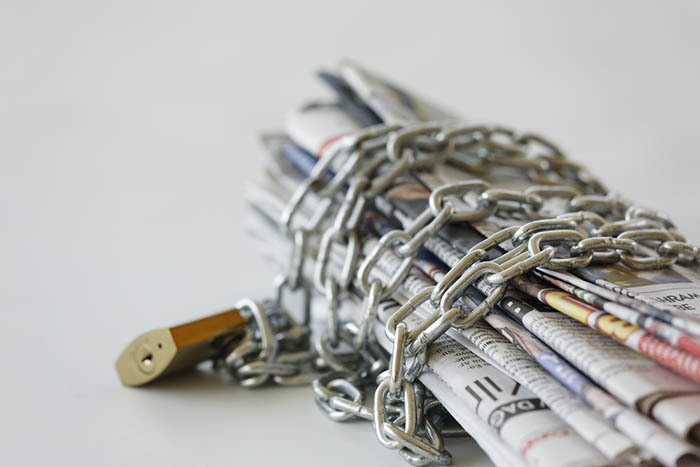 New amendments to a 2014 law by the State Duma prohibit foreigners from establishing and owning more than 20 per cent of any Russian media outlet. If Kudryavtsev is deprived of his Russian citizenship, he will not be able to continue owning Vedomosti and other outlets under the Independent Media umbrella. Hannah Machlin, project officer of the Mapping Media Freedom project, said: “The decision to take away Kudrayastev’s passport will affect the legality of his ownership of media outlets Vedmosti and the Moscow Times, making it a clear violation to press freedom”. Özgür Gelecek daily’s Newsroom Editor Aslı Ceren Aslan was arrested on 21 February in Şanlıurfa province, Cumhuriyet newspaper reported. Aslan, who was detained on 18 February, was allegedly subjected to physical violence and strip searched twice during her detention and arrest. Özgür Gelecek reported that Aslan was in Şanlıurfa to report on the recent developments in Syria at the time of her detention. Her arrest brings the number of journalists in Turkish prisons to 154. Boris Pejovic, a photographer for daily newspaper Vijesti, was insulted and pushed during a brawl on 15 February between MPs from the ruling Democratic Party of Socialists and the opposition Democratic Front in the Parliament of Montenegro, daily newspaper Vijesti reported. As Vijesti reported, MPs and Parliament security pushed and insulted Pejovic. Opposition leaders and supporters protested in front of Montenegro’s parliament after the ruling majority stripped two MPs of their immunity from prosecution over their alleged involvement in a coup attempt, Balkan Insight reported. The incident was strongly condemned by the Trade Union of Media of Montenegro (SMCG).